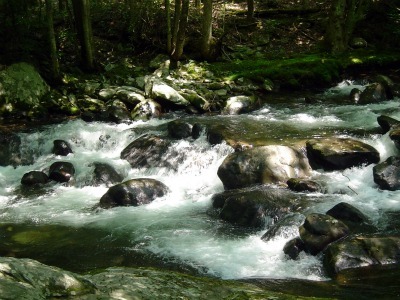 River Hikes, Along the River and Through the Woods of the Smokies! 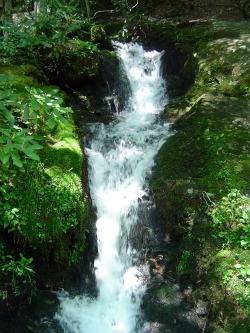 River hikes are one of the most pleasant ways to enjoy the serenity of the Great Smoky Mountains National Park. 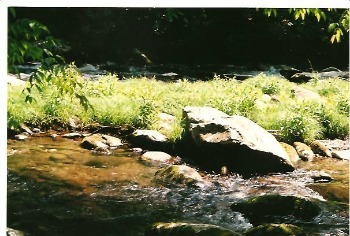 The roar of rapids and the trickle of a stream have a way of easing our tension and relaxing us. God's creation has a way of doing that. Hiking along Cucumber Gap Trail, you'll see plenty of wildflowers. Travel for 2.4 miles until you reach the Little River Trail. Make a left here. Little River is a wide, easy trail. You'll come to a small cascade on the left with a bench. This is a nice spot to stop and reflect on the beauty around you. As you're hiking along Little River, keep an eye out for something interesting on the river. In a couple of spots, I noticed grass growing on the rocks in the middle of the river. I thought it was pretty neat, having never seen that before. 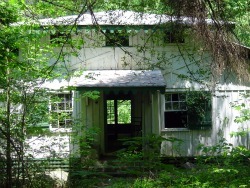 As you reach the end of the trail, you'll see more abandoned vacation cabins. Approximate Elevation: Starts at 2350' at Jakes Creek Rd. Trail ascends to 2500' at Cucumber Gap junction. Trail ascends and peaks at 3000' then descends to a little above 2500' at Little River junction. Trail ends by descending to 2200' at Elkmont Rd. How to get to the trail: From Sugarlands Visitor Center, head west on Little River Road and turn into Elkmont. Turn left for Jakes Creek Trail, just before Elkmont Campground. Tip: If you park in the lower parking lot, you'll be a little closer to your car when you end the loop from Little River Trail. Smokemont Loop The longest footbridge in the park and access to a cascade and waterfall are the highlights of Smokemont Loop. This 6.1 mile hike is my favorite in the Smokemont area. Oconoluftee River Trail This is a great family hike along the river on the Cherokee side of the Smokies. The kids will love having access to the water and it's a gravel trail, so don't worry about slippery rocks. You can jog this one too or bring your dog along! What a pleasant river stroll! This wonderful family hike has wildflowers and a cascade. It's also only 2 miles one-way with a backcountry shelter at the end.